New imaging technologies allow recording brain activity much faster, at a super high resolution and from very large brain areas, thereby collecting huge amounts of data. Although the next major advances in the field of neuroscience will crucially depend on the ability to analyze and interpret such vast amounts of brain activity data, dealing and analyzing large data sets is challenging for most labs. 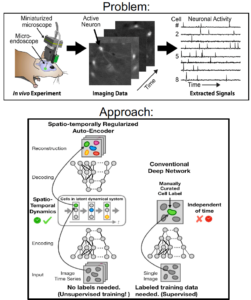 Here we aim to develop a superior cell extraction algorithm based on a deep structured variational autoencoder (SVAE) that can be trainedunsupervised on large amounts of unlabeled data to extract neuronal signals from in vivo calcium imaging movies (single-and two-photon). Impact on Neuroscience Community: Solving the cell extraction bottleneck would allow hundreds of labs to implement a fast, precise and reliable cell extraction process for analyzing their calcium imaging data. Impact on other Fields: The SVAE classifier could be adapted in other disciplines, e.g., in the medical domain. In principle it can be applied to all kinds of dynamics or time series data, underlining the huge future potential for the use of hybrid SVAE classifiers.